How to complete the Spider's latest bounty by finding Wanted: Student of Beltrik in Destiny 2: Forsaken. In Destiny 2: Forsaken, players have been wanting to know where to find Wanted: Student of Beltrik. First, to unlock this Wanted Bounty, you’ll need to head over to the Tangled Shore and talk to the Spider. There, you’ll be able to purchase the Wanted: Student of Beltrik bounty for a total of four Ghost Fragments. Once the Wanted: Student of Beltrik bounty has been unlocked in Destiny 2: Forsaken, you’ll need to head to the Exodus Black region of Nessus to begin completing your bounty. To make things easier, we’ve put together a guide on where you can find Wanted: Student of Beltrik in Destiny 2: Forsaken! Wanted: Student of Beltrik can be found in the Exodus Black region on Nessus in Destiny 2: Forsaken. 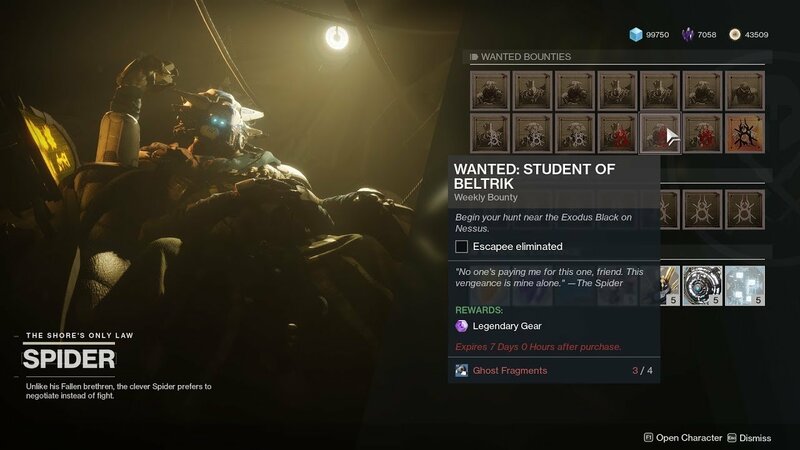 In Destiny 2: Forsaken, players have the ability to purchase Wanted Bounties from the Spider, including Wanted: Student of Beltrik. If you have unspent Ghost Fragments and are looking for something to do, head over to the Tangled Shore and interact with the Spider to purchase the Wanted: Student of Beltrik bounty. Above the lore text are instructions that indicate you’ll need to begun your hunt for Wanted: Student of Beltrik in the Exodus Black region on Nessus. Upon spawning into the Exodus Black region, make a right and head down to the area below. Here, Wanted: Student of Beltrik will spawn. Because Wanted: Student of Beltrik is a High-Value Target (HVT), you'll want to begin attacking him as soon as he spawns in Destiny 2: Forsaken. Like Wanted: Splendid Mind, Wanted: Student of Beltrik is what’s known as a High-Value Target (HVT), meaning other Destiny 2 players have the ability to kill this enemy. Wanted: Student of Beltrik spawns in every 10 minutes. Once the target spawns, you’ll want to begin attacking immediately. This is because, if other players land hits on Wanted: Student of Beltrik first, you may not earn credit for the kill, forcing you to wait another 10 minutes to try again. After taking down Wanted: Student of Beltrik, return to the Spider in the Tangled Shore to turn in your bounty and receive your Legendary rewards. For a visual guide, be sure to check out the video on where to find Wanted: Student of Beltrik courtesy of YouTuber Massive Trigger Gaming (seen below). 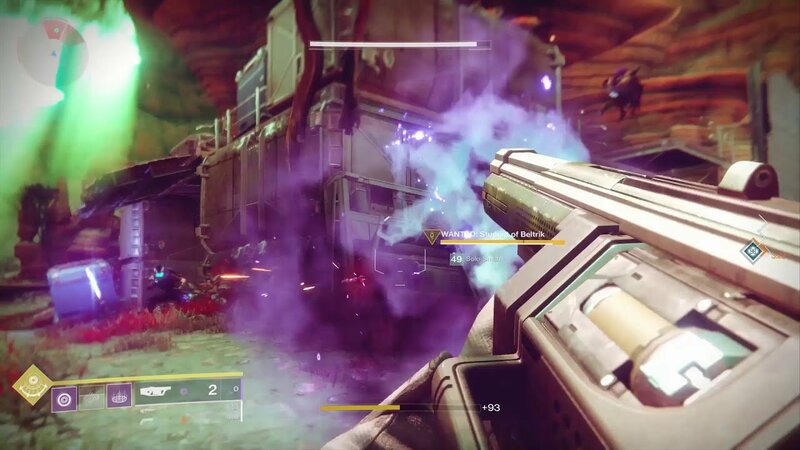 For more on Destiny 2: Forsaken, be sure to check out some of our previous guides including where to find Wanted: Splendid Mind in Destiny 2: Forsaken, where to find Wanted: Pandrok, Pillar of Nothing in Destiny 2: Forsaken, and where to find Toland in Destiny 2: Forsaken. By reading through this guide, you should now know where to find Wanted: Student of Beltrik in Destiny 2: Forsaken.